Roof Restoration and Roof Coatings for Northeastern Iowa! Ethylene Propylene Diene Monomer (EPDM) roofing is a type of thermoset membrane roof material. It is the most common material used to create rubber roofs, and is derived from oil and natural gases. EPDM roofs are widely used in commercial and residential applications. 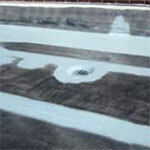 EPDM roofs are fairly unattractive and over time, EPDM rubber roofing experience wear-and-tear problems. The biggest problem is that the synthetic rubber’s dark colors instead tend to absorb most of the sun’s rays, leading to degradation of the EPDM’s membrane. As the membrane decomposes, it becomes more susceptible to puncturing. Power wash and clean with WAC II Roof Cleaner. Prime surface with Tack Coat primer. 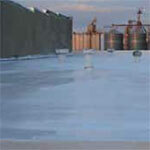 Reinforce seams with Spunflex imbedded in Rapid Roof III or Equinox base coat. 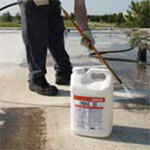 Seal entire roof with Rapid Roof III or Equinox top coat. Schwartz Commercial Roofing utilizes Conklin's innovative roof recoating systems, which can actually extend the life of your existing EPDM or Modified Bitumen roofing system and save on energy costs at the same time. 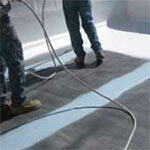 An EPDM coating system is an effective and economical alternative to a complete tear. Conklin's elastomeric roof coatings provide cost-effective roof restoration for approved single-ply substrates, resulting in improved energy savings, and years of new life for an old roof! Adding a white, energy efficient, lightweight coating on top of your current black EPDM roof is the smart choice for a number of reasons. Today there are millions of square feet of heavy, black BUR and Mod. Bit. roofs in serious decline due to age and the effects of thermal expansion. By applying one of Conklin's lightweight, white, reflective coatings directly on top of their existing substrates, building owners can save substantial time and money. Waterloo, Iowa Falls, Mason City, Decorah, Dubuque, Fort Dodge, Spencer and surrounding communities!